Are the monks making tonic wine or Commotion Lotion? Buckfast Abbey in England is a community of Catholic monks who maintain their lives through bee-keeping and through the production of a tonic wine, made according to a method brought when French monks re-founded Buckfast Abbey more than 300 years after its dissolution by Henry VIII. Such traditional tonics are just what one expects from an abbey refounded in the 19th century by strict Benedictine monks. But the Scottish police tell a different story. 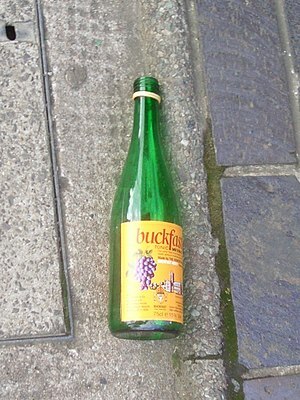 According to news reports on the BBC, the Scottish police report that “the tonic wine Buckfast has been mentioned in thousands of crime reports by Scottish police in the past three years, including 114 cases of the bottle being used as a weapon.” The report cites common names for the tonic wine including Commotion Lotion and Wreck the House Juice. Whatever it’s name, its combination of a quite a bit of caffeine (Caffeine, 37.5mg/100ml according to Wikipedia) with a relatively high alcohol content (15% ABV) seem to contribute to its popularity. The monks have not made the tonic wine themselves since the 1920s, after they were not able to retain their license to produce it. They continue to sponsor its production and, I think, to benefit from the proceeds. I have to wonder if the characteristics of the wine are the real cause of the complaints. There are plenty of other inexpensive high-alcohol content drinks available in the UK as in the USA, most of them implicated in a number of crimes. Bucky’s unusual flavoring and history are noticeable, making it more likely that the brand name will show up in police reports. No, I think it is the connection with a monastery that is the source of the discomfort. St. Benedict himself could not persuade his monks to refrain from drinking wine – he said so in the Rule of Benedict – and instead limited them to moderate amounts. The tension between the ascetical view of the monk and the more moderate reality always brings out the tsk tsk response in people – as it seems to have done with the Scottish police force.